NebuPent (pentamidine isethionate), an antifungal agent, is a nonpyrogenic lyophilized product. After reconstitution with Sterile Water for Injection, USP, NebuPent is administered by inhalation via the Respirgard® II nebulizer [Marquest, Englewood, CO] (see DOSAGE AND ADMINISTRATION). Pentamidine isethionate, 4,4’-[1,5-pentane-diylbis(oxy)]bis-benzenecarboximidamid, is a white crystalline powder soluble in water and glycerin and insoluble in ether, acetone, and chloroform. Each vial contains 300 mg pentamidine isethionate. Studies suggest that the pentamidine isethionate interferes with microbial nuclear metabolism by inhibition of DNA, RNA, phospholipid and protein synthesis. However, the mode of action is not fully understood. Pentamidine isethionate, an aromatic diamidine, is known to have activity against Pneumocystis jiroveci. In 5 AIDS patients with suspected Pneumocystis jiroveci pneumonia (PJP), the mean concentrations of pentamidine determined 18 to 24 hours after inhalation therapy were 23.2 ng/mL (range 5.1 to 43.0 ng/mL) in bronchoalveolar lavage fluid and 705 ng/mL (range 140 to 1336 ng/mL) in sediment after administration of a 300 mg single dose via the Respirgard® II nebulizer. In 3 AIDS patients with suspected PJP, the mean concentrations of pentamidine determined 18 to 24 hours after a 4 mg/kg intravenous dose were 2.6 ng/mL (range 1.5 to 4.0 ng/mL) in bronchoalveolar lavage fluid and 9.3 ng/mL (range 6.9 to 12.8 ng/mL) in sediment. In the patients who received aerosolized pentamidine, the peak plasma levels of pentamidine were at or below the lower limit of detection of the assay (2.3 ng/mL). Following a single 2-hour intravenous infusion of 4 mg/kg of pentamidine isethionate to 6 AIDS patients, the mean plasma Cmax, T 1/2 and clearance were 612 ± 371 ng/mL, 6.4 ± 1.3 hr and 248 ± 91 L/hr respectively. In another study of aerosolized pentamidine in 13 AIDS patients with acute PJP who received 4 mg/kg/day administered via the Ultra Vent® jet nebulizer, peak plasma levels of pentamidine averaged 18.8 ± 11.9 ng/mL after the first dose. During the next 14 days of repeated dosing, the highest observed Cmax averaged 20.5 ± 21.2 ng/mL. In a third study, following daily administration of 600 mg of inhaled pentamidine isethionate with the Respirgard® II nebulizer for 21 days in 11 patients with acute PJP, mean plasma levels measured shortly after the 21st dose averaged 11.8 ± 10.0 ng/mL. Plasma concentrations after aerosol administration are substantially lower than those observed after a comparable intravenous dose. The extent of pentamidine accumulation and distribution following chronic inhalation therapy are not known. In rats, intravenous administration of a 5 mg/kg dose resulted in concentrations of pentamidine in the liver and kidney that were 87.5 and 62.3-fold higher, respectively, than levels in those organs following 5 mg/kg administered as an aerosol. No pharmacokinetic data are available following aerosol administration of pentamidine in humans with impaired hepatic or renal function. ii. a peripheral CD4+ (T4 helper/inducer) lymphocyte count less than or equal to 200/mm3. These indications are based on the results of an 18-month randomized, dose-response trial in high risk HIV-infected patients and on existing epidemiological data from natural history studies. The patient population of the controlled trial consisted of 408 patients, 237 of whom had a history of one or more episodes of PJP. The remaining patients without a history of PJP included 55 patients with Kaposi’s sarcoma and 116 patients with other AIDS diagnoses, ARC or asymptomatic HIV infection. Patients were randomly assigned to receive NebuPent via the Respirgard® II nebulizer at one of the following three doses: 30 mg every two weeks (n=135), 150 mg every two weeks (n=134) or 300 mg every four weeks (n=139). The results of the trial demonstrated a significant protective effect (p<0.01) against PJP with the 300 mg every four week dosage regimen compared to the 30 mg every two week dosage regimen. The 300 mg dose regimen reduced the risk of developing PJP by 50 to 70% compared to the 30 mg regimen. A total of 293 patients (72% of all patients) also received zidovudine at sometime during the trial. The analysis of the data demonstrated the efficacy of the 300 mg dose even after adjusting for the effect of zidovudine. The results of the trial further demonstrate that the dose and frequency of dosing are important to the efficacy of NebuPent prophylaxis in that multiple analyses consistently demonstrated a trend toward greater efficacy with 300 mg every four weeks as compared to 150 mg every two weeks. No dose-response was observed for reduction in overall mortality; however, mortality from PJP was low in all three dosage groups. NebuPent is contraindicated in patients with a ­history of an anaphylactic reaction to inhaled or parenteral pentamidine isethionate. The potential for development of acute PJP still exists in patients receiving NebuPent prophylaxis. Therefore, any patient with symptoms suggestive of the presence of a pulmonary infection, including but not limited to dyspnea, fever or cough, should receive a thorough medical evaluation and appropriate diagnostic tests for possible acute PJP as well as for other opportunistic and nonopportunistic pathogens. The use of NebuPent may alter the clinical and radiographic features of PJP and could result in an atypical presentation, including but not limited to mild disease or focal ­infection. Prior to initiating NebuPent prophylaxis, symptomatic patients should be evaluated appropriately to exclude the presence of PJP. The recommended dose of NebuPent for the prevention of PJP is insufficient to treat acute PJP. IMPORTANT: DO NOT MIX THE NEBUPENT SOLUTION WITH ANY OTHER DRUGS. DO NOT USE THE RESPIRGARD® II NEBULIZER TO ADMINISTER A BRONCHODILATOR. (See DOSAGE AND ADMINISTRATION). Inhalation of NebuPent may induce bronchospasm or cough. This has been noted particularly in some patients who have a history of smoking or asthma. In clinical trials, cough and bronchospasm were the most frequently reported adverse experiences associated with NebuPent administration (38% and 15%, respectively of patients receiving the 300 mg dose); however less than 1% of the doses were interrupted or terminated due to these effects. For the majority of patients, cough and bronchospasm were controlled by administration of an aerosolized bronchodilator (only 1% of patients withdrew from the study due to treatment-associated cough or bronchospasm). In patients who experience bronchospasm or cough, administration of an inhaled bronchodilator prior to giving each NebuPent dose may minimize recurrence of the symptoms. The extent and consequence of pentamidine accumulation following chronic inhalation therapy are not known. As a result, patients receiving NebuPent should be closely monitored for the development of serious adverse reactions that have occurred in patients receiving parenteral pentamidine, including hypotension, hypogly­cemia, hyperglycemia, hypocalcemia, anemia, thrombocytopenia, leukopenia, hepatic or renal dysfunction, ventricular tachycardia, pancre­atitis, Stevens-Johnson syndrome, hyperkalemia and abnormal ST segment of ECG. Extrapulmonary infection with P. jiroveci has been reported infrequently. Most, but not all, of the cases have been reported in patients who have a history of PJP. The presence of extrapulmonary pneumocystosis should be considered when evaluating patients with unexplained signs and symptoms. Cases of acute pancreatitis have been reported in patients receiving aerosolized pentamidine. NebuPent should be discontinued if signs or symptoms of acute pancreatitis develop. While specific studies on drug interactions with NebuPent have not been conducted, the majority of patients in clinical trials received concomitant medications, including zidovudine, with no reported interactions. Because the nephrotoxic effects may be additive, the concomitant or sequential use of NebuPent and other nephrotoxic drugs such as aminoglycosides, amphotericin B, cisplatin, foscarnet, or vancomycin should be closely monitored and avoided, if possible. Literature reports indicate that pentamidine was not mutagenic in the Ames bacterial (S. typhimurium) test and did not induce an increase in chromosomal aberrations in Chinese Hamster Ovary (CHO) cell or in human lymphocytes in vitro. No studies have been conducted to determine effects of pentamidine isethionate on carcinogenicity or fertility. There are no adequate and well controlled studies of NebuPent in pregnant women. A literature report indicated that intravenously administered pentamidine in pregnant rats at 4 mg/kg/day was embryolethal; teratogenicity was not observed in this study. It is unknown whether pentamidine administered via the aerosolized route crosses the placenta at clinically significant concentrations. It is not known whether NebuPent can cause fetal harm when administered to a pregnant woman. NebuPent should be given to a pregnant woman only if clearly needed. It is not known whether NebuPent is excreted in human milk. Because of the potential for serious adverse reactions in nursing infants from NebuPent, a decision should be made whether to discontinue nursing or to discontinue the drug, taking into account the importance of the drug to the mother. Because many drugs are excreted in human milk, NebuPent should not be given to a nursing mother unless the potential benefits are judged to outweigh the unknown risks. The safety and effectiveness of NebuPent in pediatric patients (birth to 16 years of age) have not been established. Body as a Whole: Night sweats. Infection: Bronchitis, non-specific herpes, ­herpes zoster, non-specific influenza, oral Candida, pharyngitis, sinusitis, and upper ­respiratory tract. Respiratory System: Chest pain, cough, and wheezing. Body as a Whole: Allergic reaction, non-specific allergy, body odor, facial edema, fever, leg edema, lethargy, low body temperature, and temperature abnormality. Cardiovascular: Cerebrovascular accident, hypotension, hypertension, palpitations, poor circulation, syncope, tachycardia, vasodilatation and vasculitis. Gastrointestinal: Abdominal cramps, abdominal pain, constipation, dry mouth, dyspepsia, gastritis, gastric ulcer, gingivitis, hiatal hernia, hypersalivation, oral ulcer/abscess, splenomegaly, and vomiting. Hematological: Eosinophilia, neutropenia, non-specific cytopenia, pancytopenia, and thrombocytopenia. Hepatic: Hepatitis, hepatomegaly, and hepatic dysfunction. Infection: Bacterial pneumonia, central venous line related sepsis, cryptococcal meningitis, cytomegalovirus (CMV) colitis, CMV retinitis, esophageal Candida, histoplasmosis, Kaposi’s sarcoma, non-specific mycoplasma, oral herpes, non-specific otitis, non-specific pharyngitis, pharyngeal herpes, non-specific serious infection, tonsillitis, tuberculosis, and viral encephalitis. Metabolic: Hyperglycemia, hypoglycemia, and hypocalcemia. Musculoskeletal: Arthralgia, gout, and myalgia. Neurological: Anxiety, confusion, depression, drowsiness, emotional lability, hallucination, hypesthesia, insomnia, memory loss, neuralgia, neuropathy, non-specific neuropathy, nervousness, paranoia, paresthesia, peripheral neuropathy, seizure, tremors, unsteady gait, and vertigo. Respiratory system: Asthma, bronchitis, bronchospasm, chest congestion, chest tightness, coryza, cyanosis, eosinophilic or interstitial pneumonitis, gagging, hemoptysis, hyperventilation, laryngitis, laryngospasm, non-specific lung disorder, nasal congestion, pleuritis, pneumothorax, rales, rhinitis, shortness of breath, non-specific sputum, and tachypnea. Skin: Desquamation, dry and breaking hair, dry skin, erythema, non-specific dermatitis, pruritus, rash, and urticaria. Special senses: Blepharitis, blurred vision, conjunctivitis, contact lens discomfort, eye pain or discomfort, hemianopsia, loss of taste, non-specific odor, and smell. Urogenital: Flank pain, incontinence, nephritis, renal failure, and renal pain. From post-marketing clinical experience with NebuPent the following spontaneous adverse events have been reported: anaphylaxis, colitis, diabetes, dyspnea, esophagitis, hematochezia, increased blood urea nitrogen (BUN) and serum creatinine levels, melena, pancreatitis (see WARNINGS), syndrome of inappropriate antidiuretic hormone (SIADH), and torsade de pointes. Overdosage has not been reported with NebuPent. The symptoms and signs of overdosage are not known. A serious overdosage, to the point of producing systemic drug levels similar to those following parenteral administration, would have the potential of producing similar types of serious systemic toxicity. (See PRECAUTIONS). Available clinical pharmacology data (see CLINICAL PHARMACOLOGY) suggest that a dose up to 40 times the recommended NebuPent dosage would be required to produce systemic levels similar to a single 4 mg/kg intravenous dose. IMPORTANT: NEBUPENT MUST BE DISSOLVED ONLY IN STERILE WATER FOR INJECTION, USP. DO NOT USE SALINE SOLUTION FOR RECONSTITUTION BECAUSE THE DRUG WILL PRECIPITATE. DO NOT MIX THE NEBUPENT SOLUTION WITH ANY OTHER DRUGS. DO NOT USE THE RESPIRGARD® II NEBULIZER TO ADMINISTER A BRONCHODILATOR. The contents of one vial (300 mg) must be dissolved in 6 mL Sterile Water for Injection, USP. Place the entire reconstituted contents of the vial into the Respirgard® II nebulizer reservoir for administration. 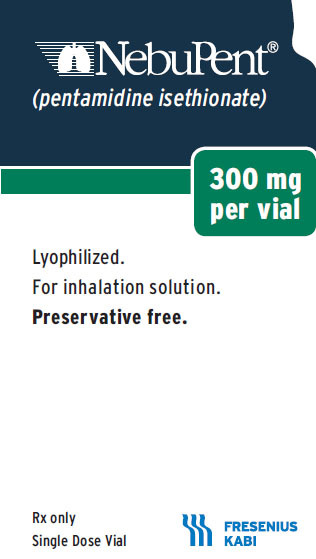 The recommended adult dosage of NebuPent for the prevention of Pneumocystis jiroveci pneumonia is 300 mg once every four weeks administered via the Respirgard® II nebulizer. The dose should be delivered until the nebulizer chamber is empty (approximately 30 to 45 minutes). The flow rate should be 5 to 7 liters per minute from a 40 to 50 pounds per square inch (PSI) air or oxygen source. Alternatively, a 40 to 50 PSI air compressor can be used with flow limited by setting the flowmeter at 5 to 7 liters per minute or by setting the pressure at 22 to 25 PSI. Low pressure (less than 20 PSI) compressors should not be used. Freshly prepared solutions for aerosol use are ­recommended. After reconstitution with sterile water, the NebuPent solution is stable for 48 hours in the original vial at room temperature if protected from light. NebuPent® (pentamidine isethionate) 300 mg per vial lyophilized product in single dose vials, individually packaged. Store dry product at 20° to 25°C (68° to 77°F) [see USP Controlled Room Temperature]. Protect the dry product and the reconstituted solution from light.